WASHINGTON, July 30 (UPI) -- The light on the screen in the White House East Room flickered briefly Tuesday, and then there was the image of President George W. Bush encouraging Americans -- in both English and Spanish -- to join hands and help their neighbors. Former Sens. Bob Dole and John Glenn, baseball player Mariano Rivera and actress Angie Harmon also offered encouragement in separate, videotaped skits viewed by a select audience -- part of a new public service announcement campaign to promote volunteerism in America. "The last 10 months have offered us a glimpse of what a new culture of service can be," Bush said at a PSA preview in the White House East Room. "And we're not going to let this moment pass. We'll sustain and extend the best that has emerged in our country." Bush's remarks came on the six-month anniversary of his USA Freedom Corps, a network clearinghouse to encourage volunteer service and put interested individuals in touch with organization needing their help. Bush, who in his State of the Union address called on Americans to devote 4,000 hours in their lifetime to volunteer work, said Tuesday that the idea was a success. VolunteerMatch, a member of the network, reported online interest in their programs has increased 72 percent compared to the same period in 2001, he said. More than 66,000 people have requested Peace Corps applications; more than 45,000 people had signed up online to participate in the newly created Citizen Corps and its programs, such as Neighborhood Watch and Volunteers in Police Service. Meanwhile, more than 140 communities have registered as Citizen Corps councils to coordinate local emergency preparedness and response. 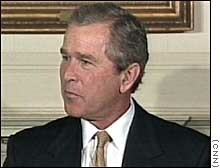 "There are good reasons for every American to serve our nation," Bush said. "We serve because it's important to our neighbors. We understand that serving others meets needs that a government can never fulfill. "We serve because it's important to our own character. Acts of compassion add direction and purpose to our lives. "And finally, we serve because it's important to our country. Our nation is the greatest force for good in history, and we show our gratitude by doing our duty. We express our love for America by loving Americans." The PSAs are for television, radio and print. Each is themed "Everyone Can Do Something." Bush said that given the public response to his call for volunteerism, the White House is launching the new USA Freedom Corps Volunteer Network, "which is the most comprehensive volunteer clearinghouse ever." The network, he said, connects Americans to service opportunities throughout more than 50,000 organizations, including America's Promise and the National Mentoring Partnership, the Points of Light Foundation, SERVEnet and the United Way and VolunteerMatch. The network is accessible through the newly redesigned USA Freedom Corps Web site, USAFreedomCorps.gov.